THE process of progressive change underway in Bolivia is facing serious challenges from the rich, mainly European or mixed-race elite, based in the eastern lowlands of the country, who are pushing for ‘autonomy’ from the central government. The government is led by the country’s first-ever indigenous president, Evo Morales, who, since his election in December 2005, has begun a process aimed at renationalising the country’s natural resources in order to lift the mainly indigenous poor majority out of crushing poverty. Morales, an Aymara Indian and an ally of Venezuela’s President Hugo Chavez, was elected with his Movement Towards Socialism party (MAS) on the back of years of struggle by the social movements against the corrupt rule of the US-backed white oligarchy. Since forming government in early 2006, Morales has started the process of returning Bolivia’s large natural gas reserves – the second-largest in Latin America – into state hands. When Morales came to power, 70 per cent of Bolivia’s land was owned by 400 individuals, and the government has now begun implementing wide-ranging land reform. With the assistance of Cuba and Venezuela, the MAS government has used the revenue from the nation’s hydrocarbons to establish health and education programmes for the poor, and has introduced the Dignity Bond, a pension for those over 60 years old. Bolivia has joined the Bolivarian Alternative for the Americas (ALBA), the alternative trading bloc established by Chavez and Cuba’s Fidel Castro. ALBA is based on mutual co-operation and solidarity, and was set up to counter the US-pushed Free Trade Area of the Americas. The government has also held elections for a constituent assembly, which handed down a draft new constitution in December 2007, to be voted on by the Bolivian people in a future referendum. This new constitution, if approved, would considerably empower the indigenous majority in a “pluri-national” Bolivia by recognising indigenous rights to land and other resources, and by ensuring their increased political participation. It would also provide the firm constitutional basis for increasing public control over the nation’s natural resources. Unsurprisingly, the prospect of the new constitution, in addition to the reforms already being implemented by the Morales government, has the right-wing elite up in arms. The latest attempt by this powerful minority to destabilise the indigenous-led reform process has been the organisation of a series of referenda on ‘autonomy’ in the wealthy, industrialised and resource-rich eastern lowland departments (or states) of Santa Cruz, Beni, Pando and Tarija. Needless to say, this autonomy movement is being heavily financed by the US Government through USAID and the National Endowment for Democracy. Massive pro-government demonstrations were held throughout Bolivia in support of national unity. The statutes contained in the autonomy referendum hand significant powers in control over land, natural resources and policing and justice, and the right to sign international treaties, over to the opposition-controlled prefectures. Beni and Pando followed Santa Cruz in voting for autonomy on 1 June, and the fourth eastern province, Tarija, held a similar referendum on 21 June. Combined, these four eastern departments account for most of Bolivia’s industry, agri-business and gas production. The backdrop to the autonomy drive is a persistent and virulent racism against the Indian majority, which the opposition is trying to harness in order to undermine Morales. Two-thirds of Bolivia’s population is indigenous, mainly Quechua and Aymara Indians, and they have faced centuries of exclusion and extreme poverty. It wasn’t until 1952 that indigenous people won the right to vote and pongage (a system of indigenous forced labour in rural areas) was halted. On 25 May, the south-central city of Sucre witnessed sickening scenes of a racist assault against Quechua Indian political and community leaders and campesinos (small farmers) in response to a proposed visit by Morales to the city. Anti-government forces, armed with dynamite, sticks, and stones occupied the stadium where Morales was due to visit. So as to avoid a confrontation, the president cancelled his scheduled appearance and withdrew the security forces from the area. Pro-autonomy protesters, many of them wealthy university students, then surrounded a group of about 50 indigenous Morales supporters and proceeded to beat them, rob them of their belongings, and force them to walk seven kilometres to the city plaza. Here they were stripped, forced to kneel and “apologise for coming to Sucre”. They were also forced to burn their ponchos, the MAS party flag and the Indian wiphala flag. Twenty-eight people were injured in the incident. This public humiliation of the indigenous councillors, mayors and campesinos was supported by the mayor of Sucre and the rector of Sucre University, who deliberately incited racist violence in order to strengthen the pro-autonomy movement. While racism is certainly part of the ideological basis of those orchestrating the autonomy movement, their key motivation is the threat to their material privileges and wealth posed by reforms aimed at empowering and enriching the poor. Washington views Bolivia as a weak link in the chain of Latin American rebellion, as the process of change is not as advanced as it is in Venezuela or Cuba. The social movements are calling on the government to push ahead with the economic programme of nationalisations and the referendum on the proposed new constitution in order to prevent the national project being derailed by the US-backed autonomists who want to prevent majority rule. But first Morales faces another referendum: a recall referendum to be held on 10 August on the presidency and the prefects of the nine departments. This law was initially proposed by MAS in December last year to resolve the deadlock between the government and opposition, but the opposition-controlled senate refused to pass the law until early May. The move is viewed by many as a manoeuvre by Podemos, the main opposition party in the senate, to regain the leadership of the opposition movement from the Santa Cruz-based autonomists. However, it is highly likely that the move will backfire badly. 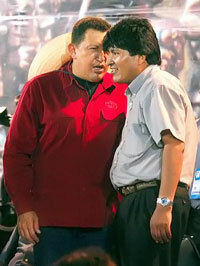 Morales’s popularity is at a high point and he will probably resoundingly defeat any attempt to recall his presidency. Some of the opposition-held prefectures are not so certain in their support and may be replaced by MAS. A victory for Morales in the recall referendum and the successful ratification of the new constitution will be crucial to demonstrating and mobilising the popular majority support for the process of change and for national unity.